Calling all animal lovers, animal rescue advocates, and shopaholics! 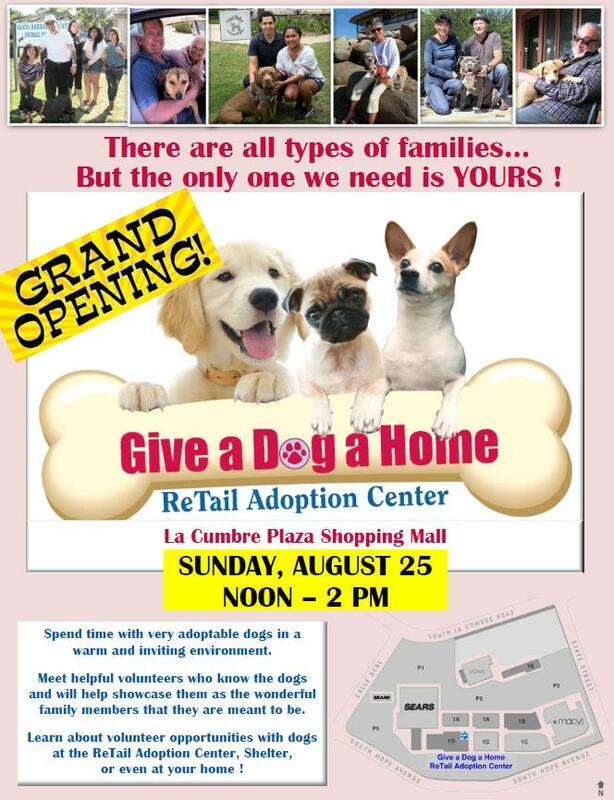 This Sunday, August 25, 2013 marks the official GRANDE OPENING of the newly established Give a Dog a Home – ReTails Adoption Center at La Cumbre Plaza here in Santa Barbara. From 12:00 – 2:00 PM, you can join the adorable available adoptable doggies, along with the gracious, giving and dedicated volunteers who’ve launched this exciting venture. There will be food, fun, furry friends, local politicians, animal advocates, and community members celebrating all things rescue dogs! What is Give a Dog a Home all about you ask? Well, thanks to the generous folks of La Cumbre Plaza donating one of their fabulous retail spaces, Santa Barbara shelter dogs are now able to spend time out of their kennels and in the presence of an enjoyable, paw-sitive location – meeting, greeting and socializing with the public. Along with finding forever homes, the ReTails group will be providing education, resources, and training demonstrations for pet-loving members of our community. Want to be involved? Visitors will be able to find out more about volunteering, becoming an “ambassador”, or even fostering! 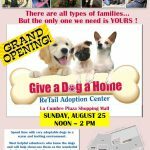 For further information, please feel free to email the GIVE a DOG a HOME Adoption Center team directly, or download the attached flyer. Looking to adopt a dog this March? If so, make sure you stop by K9 PALS in Santa Barbara to see if you can find your mutt-mate. The kind folks of the Placement and Assistance League are celebrating their 12 year anniversary with special adoption rates. And, because K9 PALS wants to be your pal too, your perfect pooch with already come spay/neutered with all of their vaccinations. But wait, there’s more! They’re even throwing in 4 FREE dog training classes to help you and your inquisitive canine start out on the right paw together! K-9 Placement & Assistance League, Inc.
March is the time to Adopt a Dog and to Celebrate! The Inquisitive Canine is proud to announce they are teaming up with Conejo Valley Adult School in Thousand Oaks California to teach a brand new workshop on helping people decide on which dog to bring into their lives. Whether you’re thinking about bringing a canine companion into your life , or giving one as a gift you’ll want to attend this “before you adopt” workshop to help you start off on the right paw! Information presented focuses on helping potential dog owners choose the best type for their lifestyle. This includes details on best age of dog, breed, size and temperament as well as resources for finding your perfect pal! Class Details: Registration opens November 1st! Contact Conejo Valley Adult School for details and to register!